Hey everyone! My next review is for Personalized Creations. Personalized Creations is a great website that sells a variety of personalized gifts from shirts to rugs, ornaments to stockings, they have it all! I did a lot of Christmas shopping here. 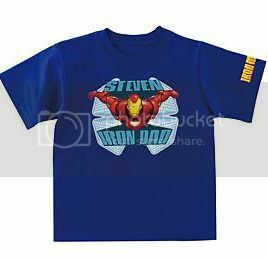 The Iron Dad shirt I actually personalized so it says Iron Uncle instead because my Uncle is a die-hard Iron Man fan. I thought it was super clever and a great gift. Everyone loves t-shirts right? I was planning on giving him a shirt anyway, but a personalized one like this make it and even more awesome gift. 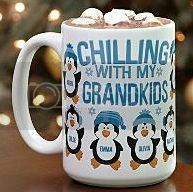 The "Chilling with..." mug I personalized for it to say "Chilling with my Grandkids" for my grandma and all the penguins have each grandchild's name on it. It can be difficult getting gifts for grandparents because they always say they don't need anything, but they do love personalized and family-related gifts even if they are little ones like this. I plan on giving her something else, too, or maybe a cocoa mix with the mug but I know she will like the mug a lot. She is an avid coffee drinker and it is pretty cute, too. 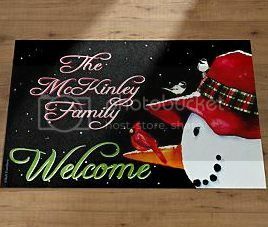 Lastly the mat you can personalize to say whatever for the first top three lines I put "The McInerney Family" and it says Welcome on the bottom. I sent it to my home with my parents because my mom loves mats like that and she was super excited to get it. It is really festive and perfect for the winter season coming up. Overall, I was super impressed with Personalized Creations and their variety of gifts. They also gave me great future gift idea, I defiitely plan on checking out their website in the next few months! Definitely check them out, you won't be disappointed! Buy It! Head on over to Personalized Creations' website and browse their awesome website! Disclaimer- I was provided a product in exchange for my review. 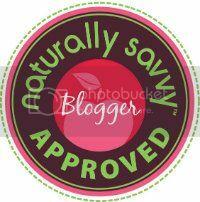 You can read more about my blog policies in my disclaimer.